Getting Here - Guyra Chamber - Guyra welcomes you, Accommodation, Restaurants, Events, Business Directory, Community Directory. Guyra is a situated between Armidale and Glen Innes in the Northern Tablelands of the New England region of New South Wales, Australia. 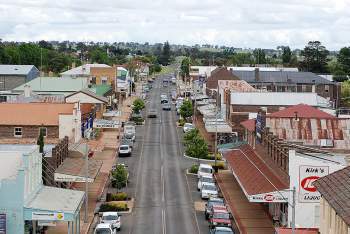 The town is on the New England Highway, 400km from Brisbane, (an hour’s flight from Brisbane to Armidale) and 550km from Sydney, (a 1hr 10 min flight from Sydney to Armidale). Guyra is a 2-hour drive from the coast, via the scenic Waterfall Way. Armidale is the nearest airport, just 1/2 hour down the New England Highway. A number of companies provide coach services to Guyra.